It's a fine point and an unscientific one. There is a specific allium species, Allium fistulosum, that is a clump-forming perennial that never grows into a bulb. These generally have the best flavor, but growing them as perennials can require a bit more care. Many gardeners grow the perennial varieties, but use them as annuals. And scallions grow so fast, it is easy enough to simply succession plant them. You could even re-root scallions from the grocery store if you leave a couple of inches of stem attached to the roots. You don't even have to plant them in the garden. Scallions will happily grow in a glass of water. When something is this ridiculously easy to grow, you might as well take every opportunity. Leaves: Scallions have hollow, blade-like leaves that fold around each other at the base of the plant. Flowers: The flowers grow on individual stems and start off covered in a papery sheath. The growing flower head will eventually split the sheath open. The round flower heads are globes of individual flowers. 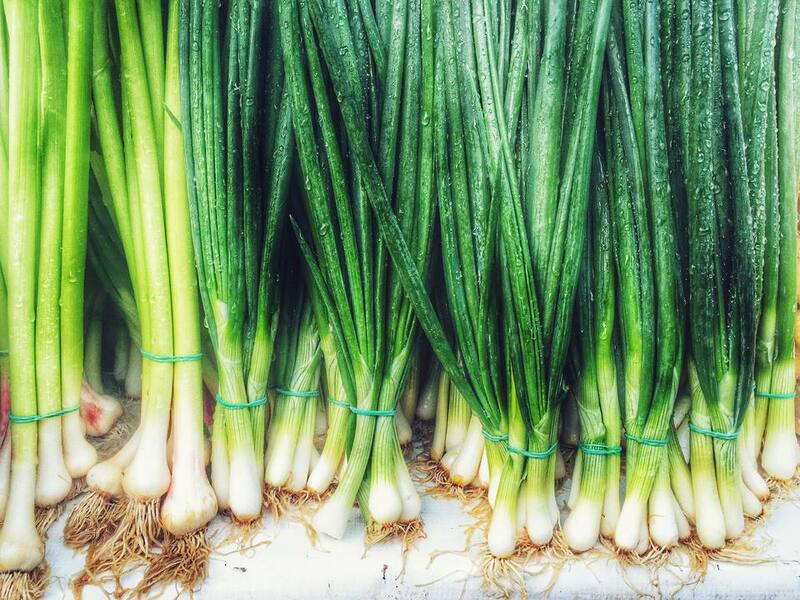 The common names are scallions, green onions, spring onions, and bunching onions. Perennial scallions are listed as hardy in USDA Zones 3 through 9. Other types are biennial, although a cold spell can make them think they have gone through winter, forcing them to go to seed their first year. These are leafy vegetables that can handle some partial shade, but they will do best and remain healthiest in full sun. Just keep in mind that they like regular water, so don't plant them in hot, dry soil. You can start seed indoors about 5 to 6 weeks before your last frost date or wait a couple of weeks and direct sow in the garden. Either way, sow the seed about 12 inches deep and somewhat thickly (4 to 8 seeds per cell). As with other onions, germination can be slow and poor. The most important thing scallion seed needs is constant moisture, which makes starting the seeds indoors, where you can keep an eye on them, a good choice. If you start them indoors, you can begin to harden them off as soon as the roots fill out enough in the cell pack so that when you gently tug on them, they don't budge. In USDA Hardiness Zones 7 and above, you can begin direct sowing in September, for winter and spring harvesting. Planting out: Plant your seedlings in a sunny spot. As with onions, scallions have a very shallow root system, so you may need to water them all season. However, don't let them sit in wet soil. It should be moist, but well-draining. Thin seedlings to about 1 ft. apart. You can eat any plants you thin. To have a continual harvest, succession plant every 3 to 4 weeks. Along with keeping the plants watered, give them some supplemental fertilizer monthly. Something high in nitrogen, like fish emulsion, would keep them green and growing. The only other maintenance would be keeping the area weed free. If you are growing perennial scallions, apply a thick layer of mulch in late fall and remove it in spring, when the soil has warmed. You will get an earlier crop that way. Most scallions are virtually problem free. If you do start noticing problems, rotating the next crop to a different area of the garden should help. There is a new garden pest that is starting to spread in the eastern states. The allium leaf miner lays its eggs in the leaves of ornamental and edible plants in the onion family. The larvae eat their way to the bulb, destroying the plant in the process. Keep watch for news on how to control this pest. Scallions are tender and mild when they are young. You can start harvesting as soon as the plants reach about 5 to 6 inches tall and are as wide as a pencil. Harvest the whole plant by pulling it out. If you planted perennial varieties, it is recommended you not harvest at all the first year, except for the thinnings. After that, you can lift the clump, divide the roots (you may need to use a knife) and re-pant 1 or more of the divisions. Alternatively, you could just plant more seed. Evergreen white bunching: A perennial variety that is nice for a winter crop in a cold frame (60 days). Guardsman: This variety falls somewhere between a scallion and a spring onion (50 days). Nabechan: This is a Japanese variety prized for its flavor (60 days). Red beard: This one is quick and easy to grow. Purple-red stalks (50 days). Tokyo long white: This is another flavorful perennial variety(75 to 90 days).